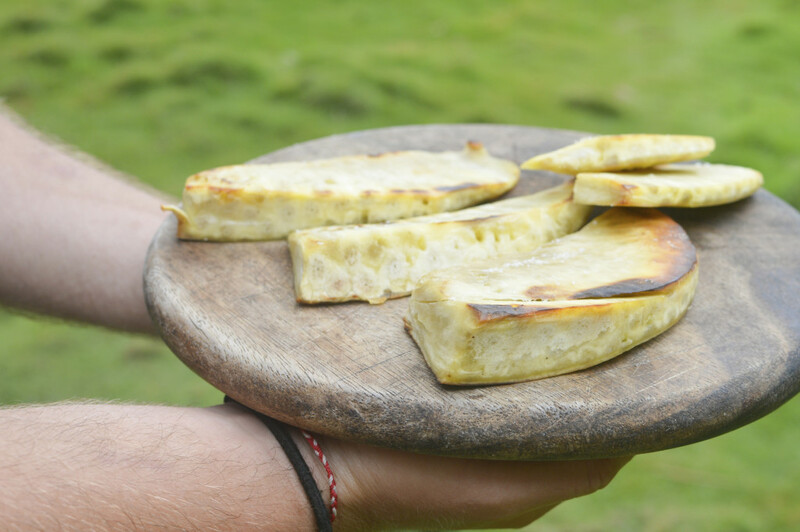 A wealth of information now exists to support breadfruit’s nutritional benefits, as well as the positive social and economic aid breadfruit farming can provide communities in developing countries. Breadfruit’s immense usefulness also roots the tree deeply in the social consciousness of many cultures. Polynesians, for example, trace the legendary origins of ulu to the war-god Kuka’ilimoku (Ku), who during a time of famine made the ultimate sacrifice: he buried himself alive in the ground to emerge as a healthy breadfruit tree to feed and shelter his family and community. Ku was the ultimate giving tree. For Pacific Islanders, breadfruit is more than a meal, it is a source of hope, an emblem of prosperity, and a symbol for thriving in life. The fruit has clearly transcended folk history and academic attention, and attained a spot in pop culture. Below are just five examples showing how breadfruit has been used as a tool to deliver impactful messages about societies through visual aesthetics, humor, music, and dance. What other fruit has a song entirely dedicated to it? 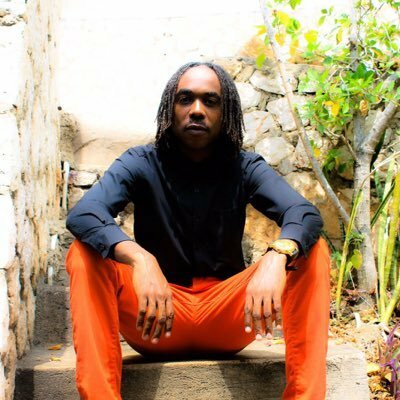 One viewing of the video for Chi Ching Ching’s catchy dancehall track “Roast or Fry (Breadfruit),” and it becomes clear that breadfruit has some serious street cred among Jamaicans. Young, old, male, female, everyone is singing along and joyfully dancing to the music that extols the greatness of the breadfruit. This shouldn’t be terribly surprising, given breadfruit’s healthful composition of carbohydrates, potassium, fatty acids, phytonutrients, calcium, magnesium and vitamins. Breadfruit was introduced to the country in 1793 and has since become a staple mainstay of the local diet. The video shows us a lust for life inspired by this delicious and robust food. Roast or fry, breadfruit calls for spirited celebration of community, life and sharing. Jamaican comedian Donald “Iceman” Anderson recently released a fifteen-track comedy recording that explores the various nuances of Caribbean life and travel. It’s a humorous reflection on the ups and downs of the people in the region that features parodies, impersonations and guest artists for improv sketches. The fact that this series takes its title after the breadfruit tree is a clear indication of how deeply embedded breadfruit is in the culture. So much so that the name of the tree becomes synonymous with routine living in the Caribbean Islands. Breadfruit provides a lens from which to view the humorous and nuanced complexities of social life in the islands. This is perhaps the most significant piece yet in the entire collection, at least to Dessie. 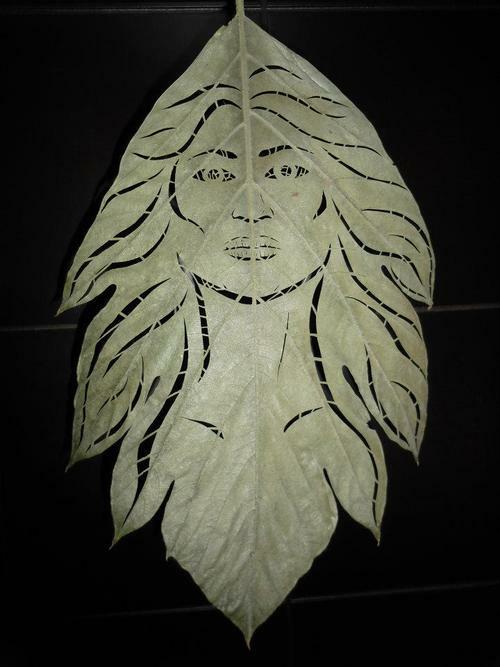 She collected this leaf from a Breadfruit tree in Puerto Vallarta with the intention of carving a woman’s face and hair, but had no notion of what the face would look like. When finished, what she saw took her breath away. Staring fiercely back was, to Dessie’s mind, the face of Mother Nature herself. The eyes radiate a glow of strength and depth, seeming to pierce the soul of the beholder, and the features are strong and native. However, the strangest thing happens when the leaf is flipped over. Suddenly the face appears softer and more vulnerable, more caring somehow. This, beyond all else, convinced Dessie that she was indeed holding something quite unlike anything else she had ever created. The duality of Nature seems to be perfectly embodied in this precious piece of art. It’s hardly a coincidence that an art piece reflecting an icon as universal and impactful as the face of Mother Nature would be revealed through the leaf of a tree that has the ability to support and sustain so much life. Every part of this tree, from root to tip, provides a valuable resource for love, healing and mindfulness. 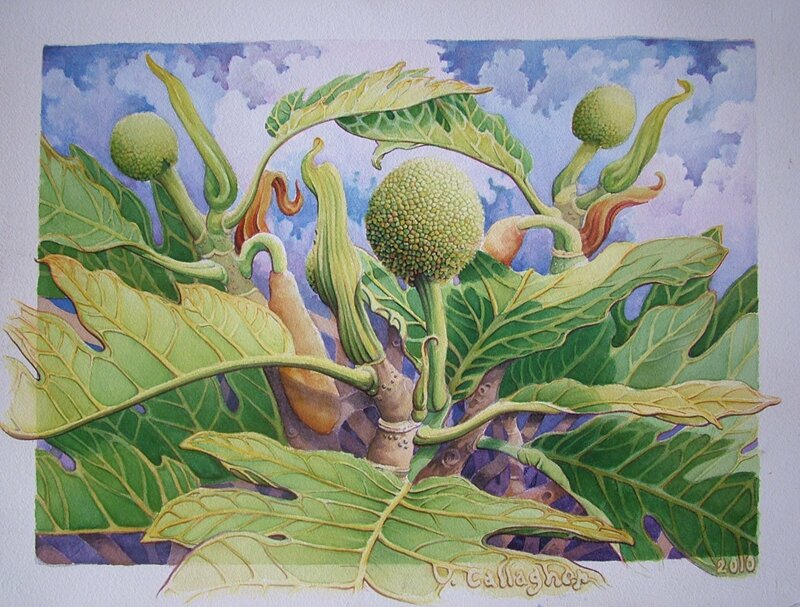 The artist’s use of the breadfruit leaf offers a critical metaphor for this tree’s vast potential to awaken care, compassion and consciousness. A Jamaican stage play that received very positive reviews, “Breadfruit is the New Bread…Baby” is concept piece similar to the Iceman comedy album mentioned above. Like the album, the play uses humor to communicate important messages about social issues and cultural idiosyncrasies. Also like the comedy sketch, the artists used breadfruit as an allegory for the daily happenings of the everyday people. Unlike “Breadfruit Tree,” “Breadfruit is a New Bread…Baby” is a fully realized stage production. The main activity of the play takes places in the Nice Bread Bakery with breadfruits placed all around the stage. In that way they are “serving a dual culinary and transition purpose,” which the audience can fully understand, given how deeply breadfruit is embedded in their society. It may have started with Chi Ching Ching’s song, but the craze of the “breadfruit dance” has spread all over the Caribbean and elsewhere. Type in the search phrase “breadfruit dance” on YouTube and you’re treated to dozens of self-produced videos of people doing the breadfruit dance. Some are alone in their room. Some are in rowdy parking lots. Some on the beach. Regardless of the location, each dancer has breadfruit on the mind and the keen notion that breadfruit, more than a food, is a way of life that takes a deeper hold with each new viewer. See for yourself. Breadfruit spreads joyful motions of people coming alive. The proliferation of home-made breadfruit dance videos jives nicely with the idea of breadfruit as a movement. Alongside the breadfruit movement that formal institutions are propelling to bring breadfruit to hungry parts of the world and to health food markets, there is another kind of breadfruit revolution spreading on ground that gives us windows into how much breadfruit matters around the world. It’s amazing to see how this humble tree can empower and unite communities, inspire creativity, and communicate greater social values.